Rosemary or Rosmarinus officinalis originates from the Mediterranean. Its name derives from two Latin terms “Ros” which means “dew” and “Marinus” which means “of the sea”. This name is perfect for this plant because of its salty texture and its ability to thrive in coastal climes. It will fill your yard with wonderful fragrance and enrich your cooking with wonderful taste. This evergreen perennial herb likes full sun and well-drained sandy soil. So keep your soil slightly moist but not too wet and your rosemary will thrive. It doesn’t matter whether you’ll grow it in a container or in the herb plot if you take care of it properly you’ll enjoy its benefits. If you are growing plants for your everyday cooking needs, it’s better if you grow several so you will always have one ready to take cuttings from. This daily pruning will give you full and healthy plants. Wait until the plant has just begun to bloom if you are growing rosemary for drying purposes. At that point the plant has its maximum oil content and flavor. Take a pair of kitchen shears and a harvesting basket. Cut off the top 2 to 3 inches of each sprig but be careful not to cut the plant too close. Make sure to give it some time to recover before winter comes. You can preserve your rosemary by bundling the clippings with a rubber band or a rope and hanging them upside down in a warm area so they could dry. In about ten to fourteen days, when the leaves are dry, strip them off the stems and place them in a container or a jar with a tight- fitting lid. You can use rosemary in anything you like because it will give a special kick to your food. Add it to quiches, stews, roast. Add it to your juices, salads or drinks and enrich the taste of your every plain dish. Cut 4 or 5 stems of Rosemary and add them in a cup of olive oil. Put this mixture on a stove and simmer over medium heat for five to seven minutes. Then let the infused olive oil to cool. Pour this mixture into a bottle. Seal the bottle and season every salad or food whenever you like. This can also be a great idea for a gift to someone who just loves rosemary taste. Add a cup of rosemary leaves to three cups of salt. Stir this mixture well, cover it and let it sit for approximately two weeks. You can use this infused salt on any dish that you like. Grilled fish, roast vegetables, chicken will be enriched with a new flavor by adding this salt to them. Put a cup of honey in a small pot. Then add five rosemary springs to it. Put the pot on a stove and simmer for about five minutes. Remove the pot from the heat and let it cool for about 45 minutes. Remove the rosemary springs and pour the honey in a container. You can use the infused honey on your toast, drizzle it over goat cheese or brie or to sweeten your tea or juice. When it comes to sauces rosemary is certainly the right choice. When you are making marinades you can’t make a mistake combining rosemary with garlic, citrus, butter, peppercorn, olive oil, balsamic vinegar or even port. While in soups the herb pairs well with roast mixed vegetables, sweet potato, potato, chicken, chickpea, zucchini and the list goes on. Put a cup of water into a pot and add 2 ½ cups of sugar. Put it on the stove and heat it until it boils. Remove it from the heat. Add 9 springs of rosemary into the pot and let it steep for 30 minutes. Then strain the mixture and add it to ½ cup of lemon juice and 4 cups of cold water. Let it cool for some time. Taste it and add some sugar or water according to your preference. Detox your body by adding a few springs of rosemary in a bottle of water or give your cocktails a kick by adding rosemary. Stay hydrated during the summer with rosemary and grapefruit infused water or sparkling rosemary limeade. Add some lemon and rosemary into your iced tea. You can also try a blend from apple, pear and rosemary to stay hydrated all summer long. Relax at the evening after a hard day at work with a rosemary gimlet gin or a lemon and rosemary bourbon sour. Use rosemary essential oil to relieve yourself from anxiety, indigestion, joint pains, cold, flu, headache, bad circulation and much more. 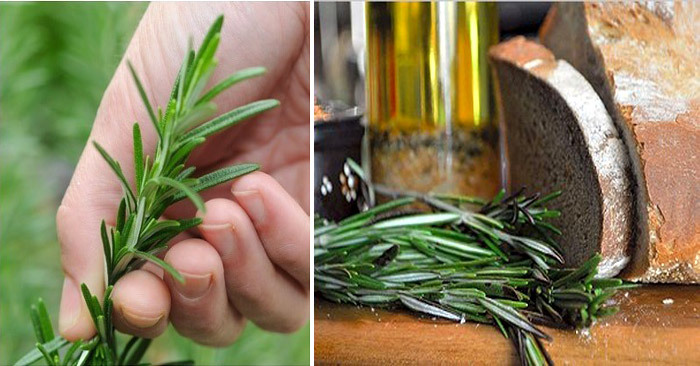 You can easily make your own rosemary essential oil. All you need to do is infuse your rosemary leaves in carrier oil like jojoba or olive oil. Put the oil in a jar and leave it in a sunny position for three to six weeks. You can use this oil for mental clarity, aching muscles and relaxing massages. If you are suffering from a stuffed up nose or chest congestion rosemary is the right remedy for you. On the one hand is guaranteed to bring you relief and on the other it’s completely safe. Boil some water in a pot or kettle and transfer it immediately into a large heat proof bowl. Add two spoons of fresh or dried rosemary and stir well. Cover your head with a towel and lean over the bowl. Breathe in the vapor for up to ten minutes. Rosemary is natural antiseptic that helps open nasal passages. Prepare yourself a rosemary tea to relieve the pain of heartburn and intestinal gas. Apply some rosemary oil topically to help lessen the severity of toothaches, eczema, headache, joint or muscle pain or gout. These analgesic and anti-inflammatory properties of the rosemary were recognized by the German Commission E (the scientific advisory board of the German version of the FDA) and they approved rosemary essential oil as good treatment of muscle pain and arthritis. Boost mental clarity and enhance cognitive performance by sipping on a cup of tea or by diffusing essential rosemary oil around your home. This amazing herb will also prevent the aging of your brain, and will help you keep sharp even in your old age. This is due to its carnosic acid content which fights off free radical damage. Sooth skin irritations like acne or eczema by adding some rosemary essential oil topically. You can also use rosemary essential oil to speed up healing of wounds and bruises. Mix ½ cup olive oil with ½ cup of dried rosemary and put them in a saucepan. Put the mixture on a stove and warm it up. Remove the saucepan from the heat and let it steep for 20 minutes. Then strain the mixture and pour it in a bottle. Use this mixture as a hair mask. Soak your scalp with it and cover it with a towel or a shower cap for 20 minutes. Then rinse with cool water and shampoo your hair as you normally would. Include more herbs like rosemary, basil, parsley, mint and sage to your meals and stop using your chemical laden deodorants which are harmful to your health. Improve the health of your hair with rosemary and nettle combination. This great shampoo will help you get rid of dandruff and will also stimulate blood flow which will speed hair growth with regular use. Moreover, a research has shown that certain essential oils including rosemary improve hair growth and hair quality by removing impurities, unblocking hair follicles and stimulating the scalp. Add some rosemary, lavender, thyme, cedar wood, and peppermint into your shampoo and massage it weekly into your scalp. Fight off bad bacteria which are responsible for tooth decay and gum disease and even get rid of the bad breath by using rosemary’s antimicrobial properties. Add a few drops of rosemary oil to your regular toothpaste or make a potent mouthwash by boiling four rosemary springs into two cups of water.